Above: Mayor said the police and the casino’s security team work hand-in-hand. 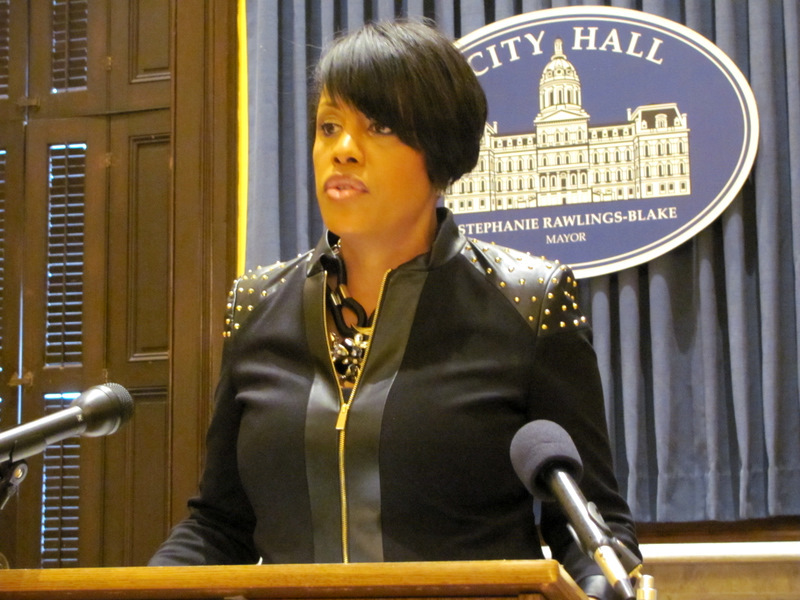 Describing Horseshoe Casino as a future “anchor institution” of Baltimore, Mayor Stephanie Rawlings-Blake yesterday defended the beefed-up police presence at the facility. The Brew reported Tuesday that the police department has more than doubled the originally-planned staff – from 7 officers to 18 officers – to a “casino mini-district” around the facility. Three shifts of police are currently assigned to the casino district, the majority of them on overtime pay from the department’s general fund. In addition, the city has spent $1,024,000 for fiber-optic infrastructure and CitiWatch cameras along the perimeter of the casino, with staff assigned to monitor the cameras around the clock. Asked why Caesars Entertainment, the casino operator, does not provide more of the security, the mayor did not directly respond. Instead, she talked about the casino’s importance in achieving her plans for “continued property tax reduction, the funds for school construction and recreation center plans.” The mayor is counting on the casino to pay for a 2-cent-a-year reduction in homeowner property taxes and has allocated 10% of casino property tax receipts for school and recreation center construction. In addition to property taxes, the casino generates “community impact funds” from its slot machine earnings. In the first two months of casino operations, those funds have been below the administration’s projections. In September, the casino generated $733,370 in such funds, according to the Maryland Lottery and Gaming Control Agency. In October it generated $693,959 despite an extra (31st) day in the month, the agency reported yesterday. Rawlings-Blake explained at her weekly press conference that “we work with our institutions, whether it’s the casino or the universities and colleges or hospitals, to develop effective policing strategies. And we will do that with Horseshoe as well. It will become one of our anchor institutions, for lack of a better word, in the city. And its success is important. “How will you get there?” she was asked.